First 3D printed knee for cat! It’s the kind of diagnosis you dread. 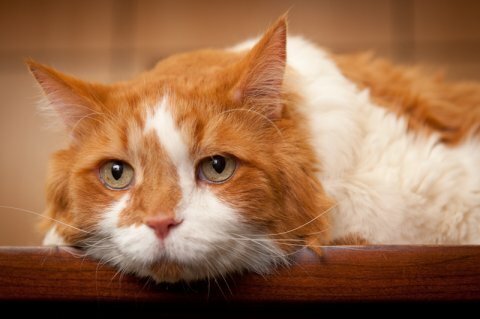 When Cyrano developed bone cancer in his left hind leg, his owners wanted to get him the best treatment possible to bring him back to full health. After successful radiation treatment that eliminated the tumour, Cyrano went into full remission. Unfortunately, because of the invasive nature of the cancer, Cyrano was left with bone deterioration in his distal femur and he was unable to use his painful knee joint. In cases like this, surgeons normally choose to amputate the affected limb; however, at 26 lbs, Cyrano wouldn’t be able to support his weight with only three legs. 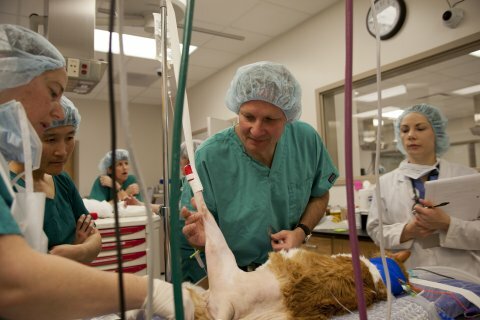 Undeterred, Cyrano’s owners enlisted the help of experienced veterinary surgeon and orthopaedic specialist Dr Denis Marcellin-Little and his long-time collaborator Ola Harrysson, Professor of Industrial and Systems Engineering at North Carolina State University to create a custom solution for their beloved pet. Dr Marcellin-Little and Prof Harrysson have worked with Materialise using Additive Manufacturing in surgeries for over 10 years. With amputation out of consideration, they felt that 3D Printing could provide an ideal solution for Cyrano because of its ability to create small but detailed parts to exacting specifications. Cyrano would thus become one of the very first cats to receive a miniature, limb-sparing total knee arthroplasty. Starting with CT scans of both hind legs, Dr Marcellin-Little and Prof Harrysson used Materialise’s Mimics Innovation Suite to generate accurate 3D models of Cyrano’s leg. Adapting the design of a knee implant used in dogs, in collaboration with BioMedtrix, an animal implant company, they then created a miniature implant that fit to the exact anatomical structure of Cyrano’s leg, and the surgical plan needed to successfully realize the procedure. Because of the small size of the bones, the integrated ability of the Mimics Innovation Suite to engineer parts on a personalised anatomical model facilitated a process that would have otherwise been extremely difficult to manage and perform accurately. Knowing the bone structure around the joint was weak, the implant was designed with stems that would anchor it into the bones. Materialise technology partner EOS then printed the implant using cobalt chromium, a metal strong enough to support Cyrano’s weight and the wear and tear that daily use would exert on the thin parts. Building the implant by Direct Metal Laser Sintering meant that mesh and porous areas that would promote integration of the implant into the bone could also be built into the piece as it was being created. These features, only achievable using Additive Manufacturing, provide enhanced long-term stability over traditional implants, giving surgeons a new option for non-standard cases such as Cyrano’s that can be tailored exactly to their needs. Since his surgery Cyrano has returned to his family, and although he now walks with a limp, he can move freely again with full use of his joint. With 3D Printing now entering the veterinary realm, cats are one step closer to experiencing their full nine lives.